GoPro Grand Prix of Sonoma, 16th and last race of 2015 IndyCar season, will take take place at Sonoma Raceway on Sunday. For ten years in a row, the last race will decide who will be the champion. Six drivers are still in the title chase. Championship leader Juan Pablo Montoya (Team Penske) has 500 points, 34 more than Graham Rahal (Rahal Letterman Lanigan Racing). Third placed Scott Dixon (Chip Ganassi Racing) has 453 points, 14 more than Will Power (Team Penske). Helio Castroneves (Team Penske, 423 points) and Josef Newgarden (CFH Racing, 413 points) rounded top 6. Out of these six, three have collected five earlier IndyCar titles (Dixon in 2003, 2008 and 2013, Montoya in 1999 and Power in 2014). 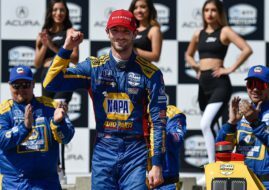 Dixon, Power and Catroneves also achieved wins at Sonoma. In 2015 season four title contenders have two victories (Montoya, Rahal, Dixon and Newgarden), Power has one win and Castroneves is winless. 25 drivers will race 85 laps on 2.385-mile track with 12 turns. IndyCar veteran Oriol Servia will drive #25 Andretti’s car in tribute of late Justin Wilson. Servia, a close friend of Wilson’s, said it will be a difficult role but he’s honored. “It’s hard for the words to come out the right way. I have known and raced Justin for more than 10 years. I have an enormous amount of respect for him as a racer, but his qualities as a human were definitely an inspiration to anyone who ever met him. I am honored and emotional with the opportunity of driving his car this weekend. I want to thank my friends at Andretti Autosport for the opportunity, and I want to express how deeply touched I am by the desire of Julia, Stefan and all the Wilson family to have me driving the No. 25,” said Servia. American Honda Motor Company and Honda Performance Development announced a contribution to the Wilson Children’s Fund based on laps completed by all Honda entries. They will contribute $50 per lap completed at Sonoma by each of the 13 Honda entries for a possible donation of more than $55,000. A decal created to honor the memory of Wilson will be on the race cars this weekend. The logo also is on T-shirts that will be on sale at Sonoma Raceway and available online, with 100 percent of the net revenues donated to the Wilson Children’s Fund.